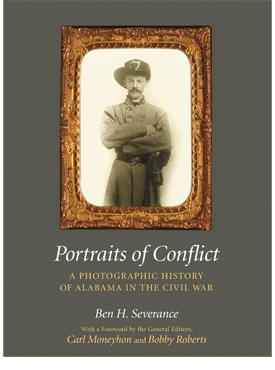 Portraits of Conflict: A Photographic History of Alabama in the Civil War is the tenth volume in this acclaimed series showing the human side of the country’s great national conflict. Over 230 photographs of soldiers and civilians from Alabama, many never seen before, are accompanied by their personal stories and woven into the larger narrative of the war both on the battlefield and the home front. Alabama is unusual among the Rebel states in that, while its people saw little fighting inside its boundaries, nearly one hundred thousand Alabamians served with Confederate units throughout the South. This volume chronicles their experiences in almost every battle east of the Mississippi River—especially at Sharpsburg, Chancellorsville, and Gettysburg under the legendary Robert E. Lee; at Murfreesboro and Chickamauga as part of the ill-fated Army of Tennessee; and at the famous siege of Vicksburg. Ultimately Union soldiers did invade the state, and Alabamians defended their homeland against enemy cavalry raiders at Selma and against Federal warships in the fight for Mobile Bay. The volume also includes accounts of some of Alabama’s leading politicians as well as several of its more ordinary citizens. Ben H. Severance is an associate professor of history at Auburn University Montgomery and a former officer in the United States Army. He is the author of Tennessee’s Radical Army: The State Guard and Its Role in Reconstruction, 1867–1869.